That’s the on alliteration that many people in the prepper community use to refer to the three main components of a good coffer. To prepare for an uncertain future, you should have a pantry full of non-parishable food items such as beans, wheats, rices, etc. You’ll also need a way to provide meat for your family and to protect what you have from others who wish to take it from you. That’s where the bullets and weapons come in. And finally, injuries are bound to occur so you’ll need medical supplies and the knowledge of how to use them. Hence the band-aids. With plenty of beans, bullets, and band-aids (along with the knowledge of how to properly use them), the idea is that you’ll be prepared for most any scenario. While the logic is definitely sound for the more serious and widespread TEOTWAWKI cases, the most common scenarios shouldn’t be overlooked. And those are not necessarily covered under the beans, bullets, and band-aids categories. What are those more likely events? It’s far more likely that you or your family will face a more localized threat, one that may only affect your family. Others on your street or in your community may not even realize that your world has changed. The loss of a job and the death of a spouse or child are far more likely to happen to you than a major event that affects a lot of people in your community or region. It’s no less traumatic, yet it only affects you or your family. In addition to the beans, bullets, and band-aids, it’s also a good idea to build a financial reserve that you can draw upon during times of need. This can be as simple as a savings account at a local bank or a money market account at the credit union. In fact, it can be money stored in the jar buried in the backyard. As long as it’s readily available to you when you need it and relatively risk-free. In financial terms, it’s liquid. Ah, but you say the economy is awful and it’s it better to buy items now before inflation hits and the price of supplies soar. That’s true. That’s why we stock up on many items, buying them now before the price goes up or before they are simply not available anymore. However, there are also minor financial emergencies that cannot be predicted or where stocking up ahead of time doesn’t make financial sense. No one wants to hear that an appliance has broken. As I mentioned in a prior post, our clothes dryer went out not too long ago. I diagnosed and fixed it myself and it’s running great now (and hopefully for quite some time to come). Yet, when our washing machine broke last week, I wasn’t able to identify the part that needed to be replaced. So, I called a repairman. After looking at the machine, he gave us the estimate cost to fix it. It was more than we paid for the machine when we bought it new. As a family of many, we do a lot of loads of clothes during the week. And having a washing machine is a necessity in our lives right now. Could we survive a TEOWAWKI event without one? Sure. But we are not in a TEOTWAWKI event now and it’s good to have clean clothes to go to work, to church, to the store, etc. So, we decided to not spend money on repairing the washing machine and instead bought a replacement machine. Without cash reserves, our only options would have been to do without until we could save for it or buy one on credit. Neither of those options appeal to us. So we dipped into our savings to replace the washer. 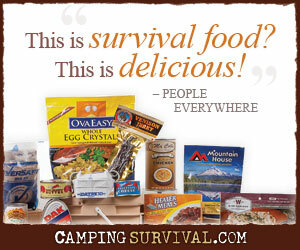 Many new preppers who have reached their “Oh my!” moment are eager to rush out and begin buying supplies. That’s not the best idea. It’s far better to sit down and plan. Consider where you are in terms of your preparedness. What do you already have? What can you do right now for little to no cost? Then consider what you will need to buy and prioritize the list. Don’t go into debt adding to your coffers. As part of the plan, include building a financial reserve. It may come in just as handy as the beans, the bullets, and the band-aids. Good post. I’ve talked before that finances should be the first thing to get in order as part of your preps. Tied with Education, followed by medical condition. Get those under control; including short term savings for situations just like what you described is fundamental to later work. Doesn’t do any good to buy several thousands of dollars worth of gear if you have to hock it to pay a bill. This can be as simple as a savings account at a local bank or a money market account at the credit union. In fact, it can be money stored in the jar buried in the backyard. As long as it’s readily available to you when you need it and relatively risk-free. I suggest a combination of all three. Immediate short term savings in the bank — something you can get to today. More morning in a mutual fund but accessible in a couple of days and some cash/cash equivalents on hand. I’ve actually moved to holding more cash/cash equivalents on hand recently. The bank runs in Spain and Greece have me concerned we could see something like that or a ‘bank holiday’ here. I wonder how much attempt you place to make this kind of magnificent informative site.